Gov Samuel Ortom has visited the wife of his assassinated aide, Dr Tervershima Adyorough, at Benue State Teaching Hospital, where she is receiving treatment. 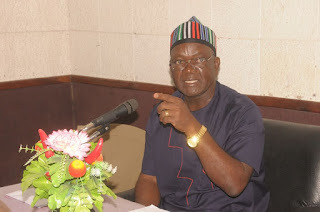 Ortom, who arrived from his China trip on Tuesday evening, went straight to the hospital to see the woman, who was also shot by the gunmen that killed her husband. Adyorough and his wife were shot by gunmen who raided their house in the early hours of Sunday morning. Gov Ortom told reporters that he would ensure that the killers of Adyorough were apprehended. He also charged security operatives to do everything possible to arrest the killers. He restated his commitment to providing good governance and achieving the targets of his administration within his tenure. He described the late Adorough as a “dependable ally who was committed to the development of the state”. Newsmen were, however, barred from entering the Intensive Care Unit (ICU) where the woman is being treated. The Chief Medical Director (CMD) BSUTH Dr Terrumum Swende, described the condition of Adyorough’s wife as “critical but stable”.